Soup is one of those food groups that as a rule fail to excite me. With the exception of a really cold winter’s day when a hot bowl of soup suddenly seems like a good idea, soup is usually the last thing you’ll find me eating (the one exception is my longtime Chinese restaurant favorite, hot and sour soup—something I’ll happily consume in any kind of weather). Chalk it up to my gluttonous disposition, but soup has always struck me as a little too insubstantial to get excited about, the thing you eat when there’s nothing else in the kitchen, or when you’re simply trying to be responsible at lunchtime and not eat that BLT. All of which makes it a little surprising that it would be this recipe for creamy zucchini soup to jump out at me from the current issue of Food & Wine. Alright, so there is a walnut cake on page 56 of the magazine that looks pretty enticing, too (and a recipe I will definitely be returning to soon as there’s a whiff of fall in the air), but it was the soup that kept calling me. 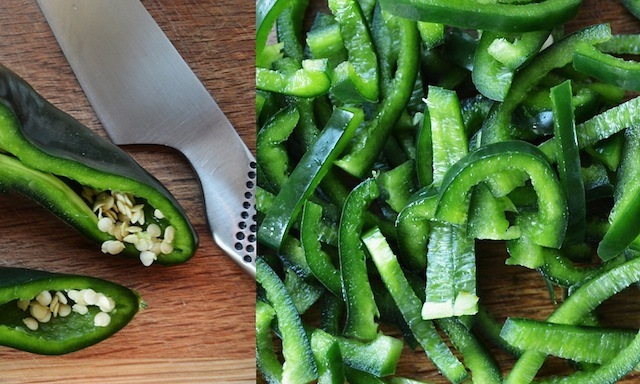 For one thing the bright green color just screamed summer, much the way a bowl of guacamole or a salad slathered in green goddess dressing does. 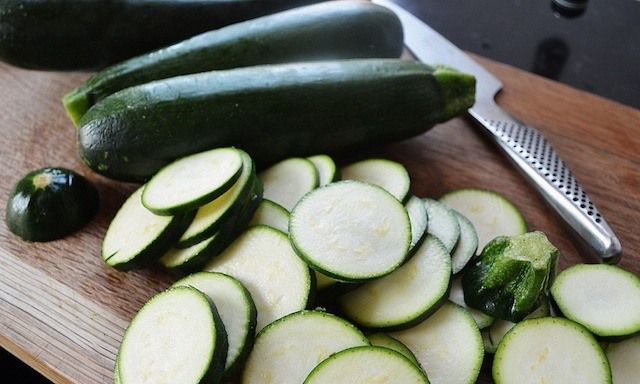 And then there were the various ingredients called for by the recipe—which in addition to the zucchini included good things like cilantro, leeks, a poblano pepper, and crème fraîche. In other words, here was a recipe with plenty of healthy, seasonal ingredients, but that still offered a dollop of decadence as well. I should also mention that all of these “healthy,” “seasonal” ingredients are ones that I love, so even without the caloric addition of the crème fraîche, this was a dish whose shopping list I would have been happy to play with under any circumstances. That said I don’t have many occasions to prepare leeks, so it was with a great deal of pleasure that I added my sliced rounds to a pot of hot olive oil and let the nutty/oniony fragrance reach my nose: olfactory bliss! Things were off to a good start, and only improved with the addition of the zucchini slices, a few cloves of sliced garlic, and some chicken stock. 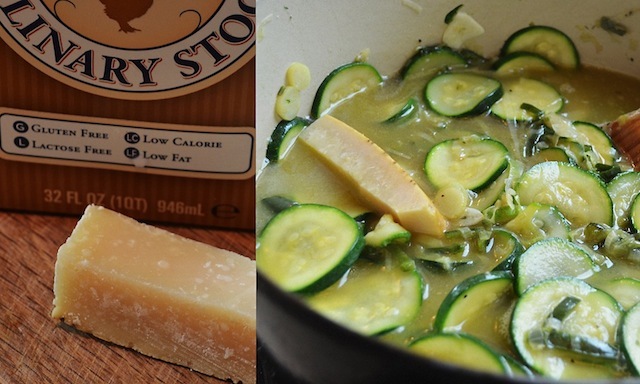 (You can also add a rind of Parmesan cheese if you want at this point, something I did and suggest you do as well, as it adds a subtle hint of earthy saltiness to the finished dish). After simmering the various ingredients for fifteen minutes or so, the soup is taken off the heat, the chopped cilantro is added (and the rind removed, if you’re using), and the chunky mixture is rendered smooth by being given a short turn (in batches, probably three) in either a blender or a food processor. 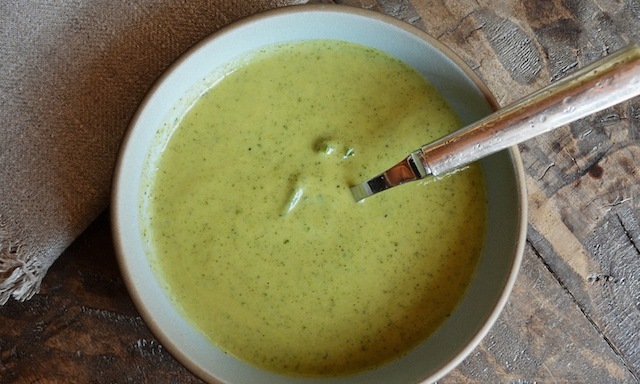 At this point the mixture, creamy but still a vivid shade of green, is returned to the pot, and the cup of crème fraîche is whisked into the puree. This last addition takes the soup from smooth to velvety and lightens the color a few shades, to something resembling sage. In terms of color and texture, you couldn’t ask for anything more enticing. Even so, none of that would mean much without the benefit of great flavor, as well—something this soup also delivers in spades. 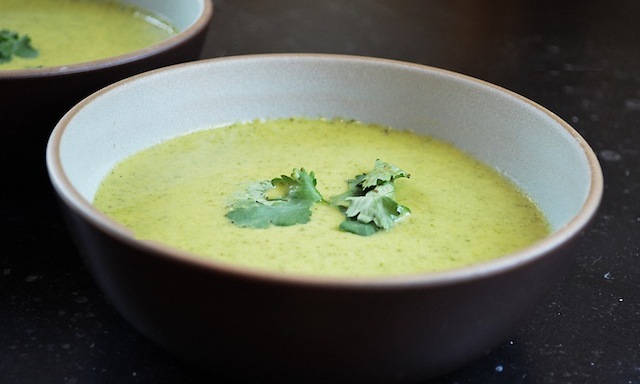 It’s subtle and earthy with a (very) gentle kick at the end thanks to the poblano, and as often happens with a good bowl of soup the pleasure lingers, wrapping you in a sense of well-being long after its gone. 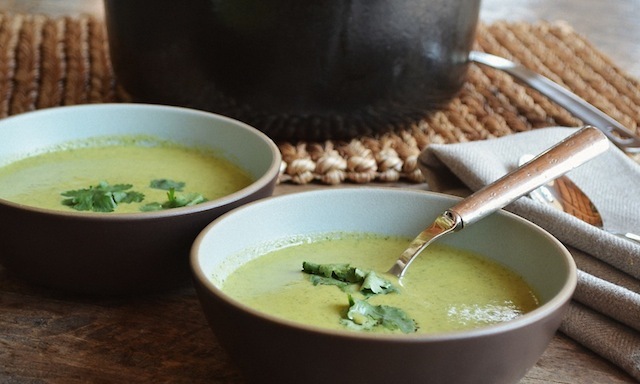 In fact, although this soup can be eaten either hot or cold, in its marriage of earthiness and refinement, it’s reminiscent of another, better known soup—vichyssoise. Like that potato based dish (which is eaten chilled), this soup, with its base of sautéed leeks and crème fraîche finish, reveals a French DNA, but one that’s enlivened with a variety of ingredients common to cooking in the American southwest, namely cilantro and that poblano pepper. It’s a cultural mash-up that comes together seamlessly here, creating a combination that’s at once classic and adventuresome. Although the soup is wonderful alone, garnished with just a few cilantro leaves, to kick things up a notch try laying a few pieces of crabmeat across the soup’s creamy surface—a pairing of the sweet and earthy that’s pretty irresistible. Or add a few homemade croutons, for a marriage of the creamy and the crunchy. Whichever way you go, this is a soup that’s sure to please… even those who aren’t sure about soup in the first place. —In a large pot, heat the olive oil until shimmering. Add the leek and poblano and cook over moderate heat, stirring, until softened, about 8 minutes. 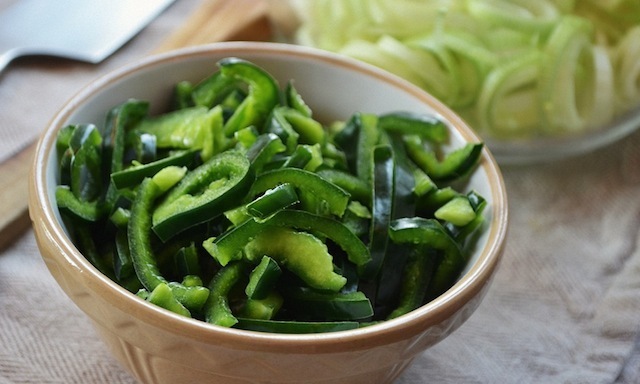 —Add the zucchini and garlic, season with salt and pepper and cook, stirring occasionally, until crisp-tender, 5 to 6 minutes. Add the chicken broth and Parmesan rind and bring to a boil. 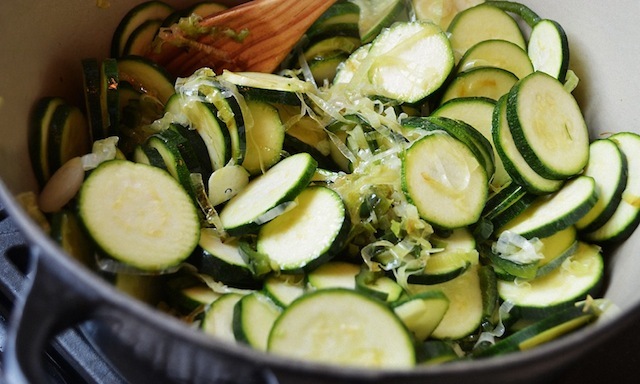 Simmer over moderate heat until the zucchini is very tender and no longer bright green, about 15 minutes. 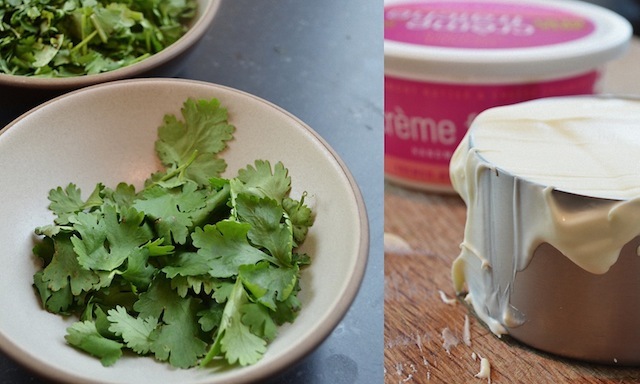 —Remove pot from heat, discard the Parmesan rind, and add the chopped cilantro. 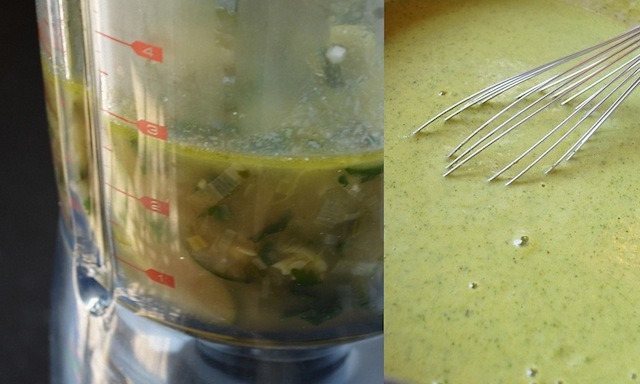 —Working in batches, puree the soup in a blender or food processor until very smooth. Return the soup to the pot, whisk in the crème fraîche and reheat gently if necessary. —Season the soup with salt and pepper and ladle into bowls. 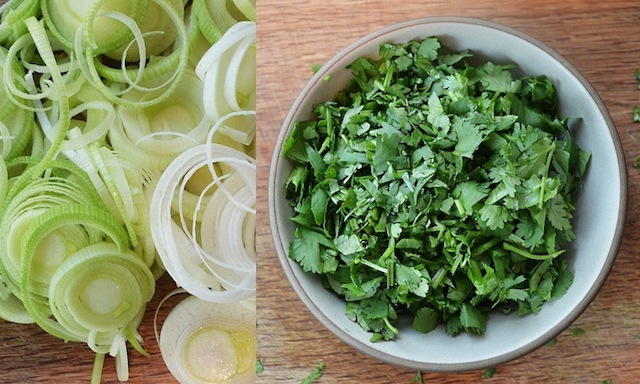 Garnish with cilantro leaves and serve. Note: The soup can be refrigerated overnight. Reheat gently or serve cold.